Height: Mature Oklahoma Redbud will attain 30 - 40'. Moderate Growth rate. Comments: Container or above-ground planter; large parking lot islands (> 200 square feet in size); wide tree lawns (>6 feet wide); medium-sized parking lot islands (100-200 square feet in size); medium-sized tree lawns (4-6 feet wide); recommended for buffer strips around parking lots or for median strip plantings in the highway; near a deck or patio; reclamation plant; shade tree; small parking lot islands (< 100 sq. ft.). Narrow tree lawns 3-4 feet wide; specimen; sidewalk cutout (tree pit); residential street tree. 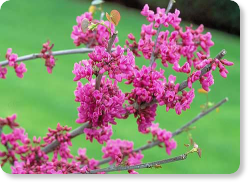 Oklahoma Redbud should be grown in full sun or partial shade on moist, well-drained soil. The glossy leaves always draw attention to the tree even by those unconcerned about trees. It is highly drought tolerant once established and grows well in all areas within its hardiness range.